Actors Kit Harington and Rose Leslie, who played on-screen lovers Jon Snow and Ygritte in fantasy TV saga “Game of Thrones”, are to wed in Britain on Saturday. The 31-year-old stars are reported to be tying the knot in northeastern Scotland, with co-stars Emilia Clarke, who played Daenerys Targaryen, and Peter Dinklage, who played Tyrion Lannister, arriving at nearby Aberdeen on Friday. The couple, who met on set in 2012, announced the engagement in the Times newspaper last September, and the wedding date was submitted to the local registry office last month. 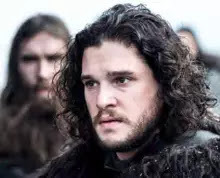 She left the show in 2014, but Harington’s iconic character has appeared in every episode. Harington told L’Uomo Vogue that the on-screen romance contributed to the pair getting together, after filming in Iceland in 2012.